Creative Knitwear, 100% cotton. Brown and white striped romper with Crest embroidered in gold, black, white, cardinal, and gray above 'BROWN' embroidered in white lettering with black outline at center. Features elastic arm and leg cuffs. 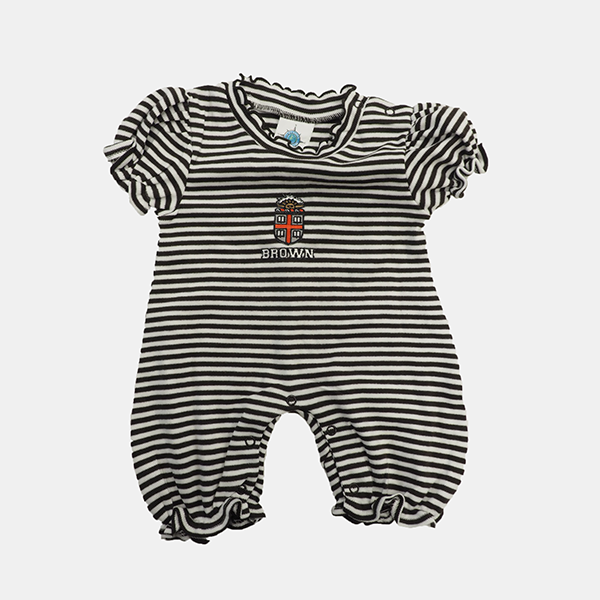 Please select option for CK Infant Striped Romper - $24.99. 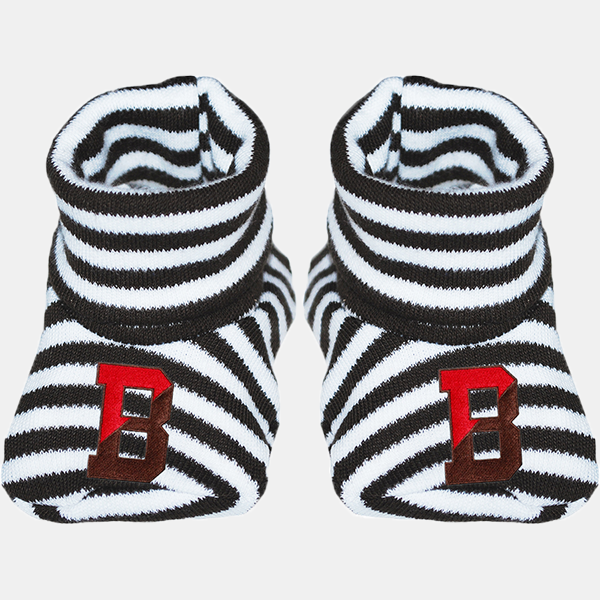 Creative Knitwear, Striped Booties with 'B' embroidered in red and brown with brown outline. Please select option for CK Striped Bootie. Creative Knitwear, 75% cotton 25% polyester. Crest embroidered in grey, cardinal, black, white, and gold in center above 'BROWN' embroidered in white lettering with black outline. Please select option for CK Tutu Pink Bodysuit. Creative Knitwear 100% cotton, white thermal blanket with brown trim and rounded corners. Grey, cardinal, black, white, and gold embroidered Crest patch above 'BROWN' embroidered in white with black outline in one corner. 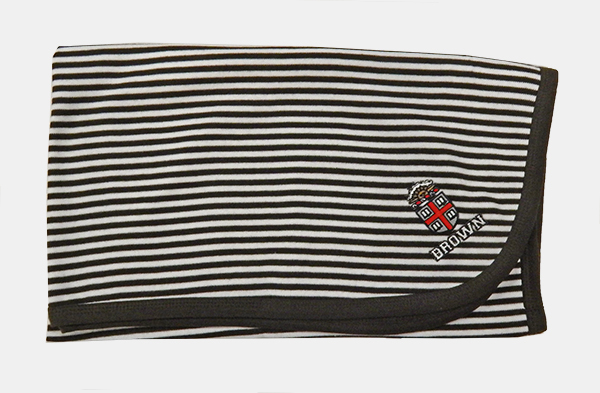 Creative Knitwear 100% soft cotton brown and white striped infant blanket with brown trim. Embroidered grey, cardinal, gold, black, and white Crest patch above 'BROWN' stitched in white with black outline in one corner. Creative Knitwear 100% cotton, 3 buttoned, brown and white striped infant dress with brown trim on cap sleeves and collar comes with brown and white striped, elastic waistband and leg openings bloomers. Grey, cardinal, black, white, and gold embroidered Crest patch above 'BROWN' embroidered in white with black outline on upper-right chest. 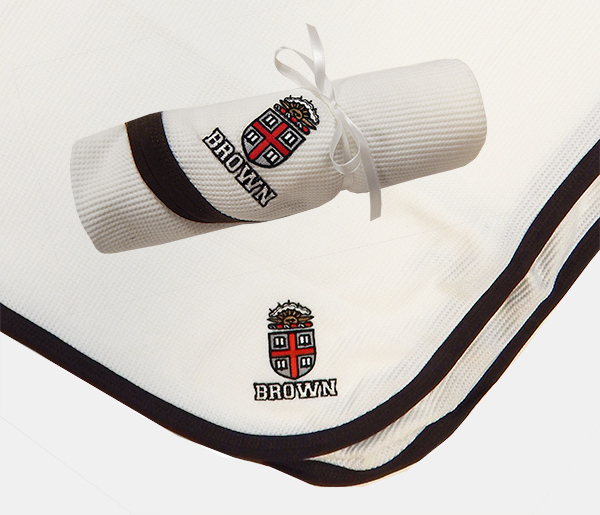 Grey, cardinal, black, white, and gold embroidered Crest patch above 'BROWN' embroidered in white with black outline on back of bloomers. Please select option for INF - CK Infant Brown & White Striped Dress w/Bloomers. 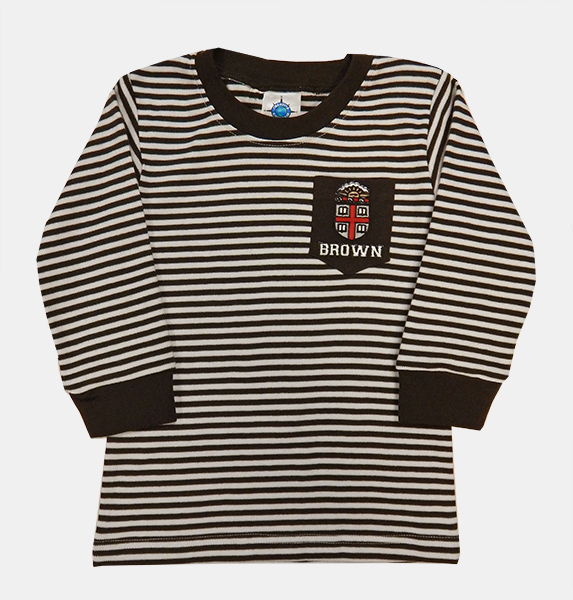 Creative Knitwear 100% cotton, brown and white striped infant long-sleeve tee with brown trim at neck and end of sleeves, and brown pocket on upper-left chest. Grey, cardinal, black, white, and gold embroidered Crest above 'BROWN' embroidered in white with black outline on brown pocket on upper-left chest. Please select option for INF - CK Infant Brown & White Striped Long-Sleeve Tee-$25.99. Creative Knitwear 100% cotton, two-button, brown cable knit infant sweater dress with cap sleeves. 'BROWN' embroidered in white with black outline on upper-left chest. 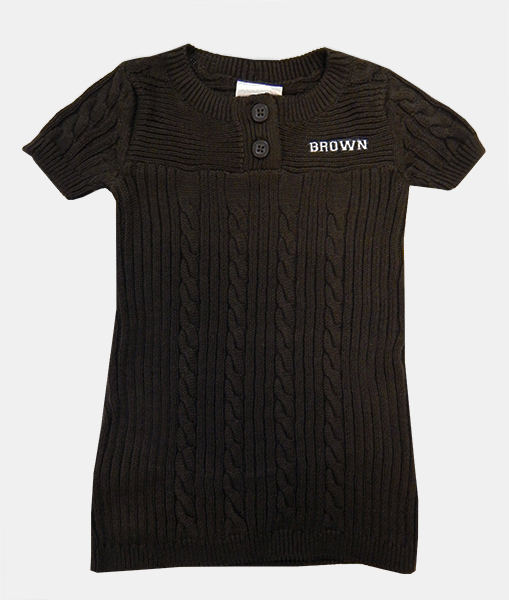 Please select option for INF - CK Infant Brown Cable Knit Sweater Dress - $35.99. 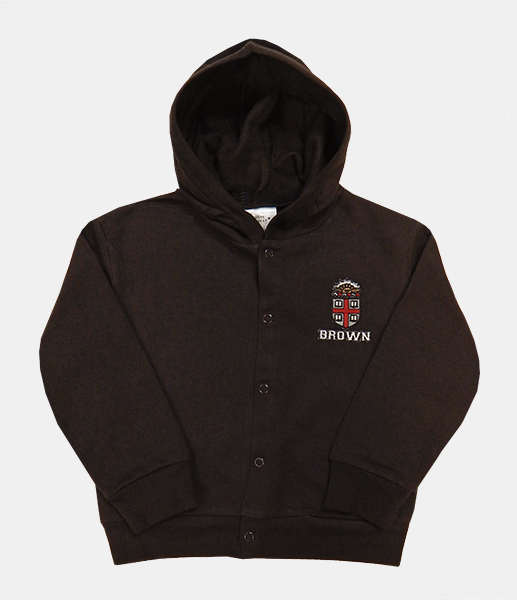 Creative Knitwear 100% cotton, brown knit infant buttoned cardigan with grey, cardinal, black, white, and gold embroidered Crest patch over 'BROWN' embroidered in white with black outline. 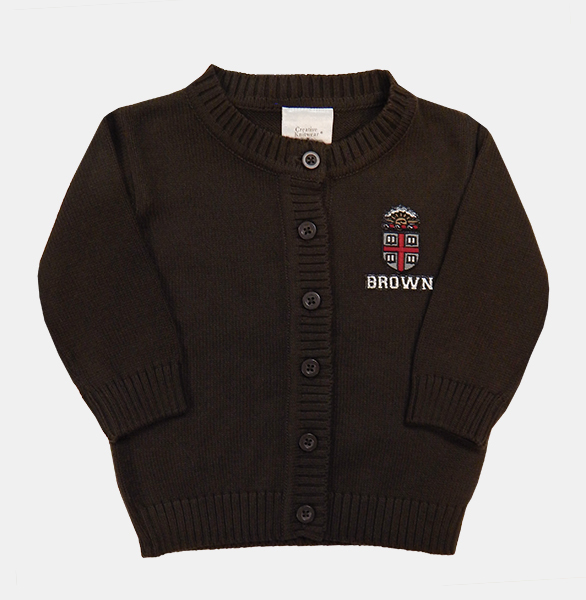 Please select option for INF - CK Infant Brown Crest Knit Cardigan - $35.99. Creative Knitwear 65% cotton, 35% polyester, snap closure, brown hooded infant jacket with ribbed trim at end of sleeves and bottom. Grey, cardinal, black, white, and gold embroidered Crest patch above 'BROWN' embroidered in white with black outline on upper left chest. Please select option for INF - CK Infant Brown Crest Snap Hooded Jacket - $27.99. Creative Knitwear 100% polyester, brown fleece infant beanie with velcro chin strap. Embroidered brown 'B' with white and black outlines entwined with green ivy with white and black outlines. 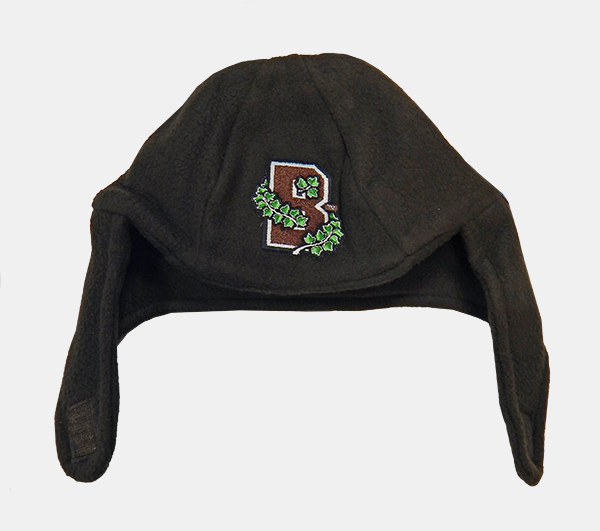 Please select option for INF - CK Infant Brown Ivy B Beanie with Chin Strap - $15.99. 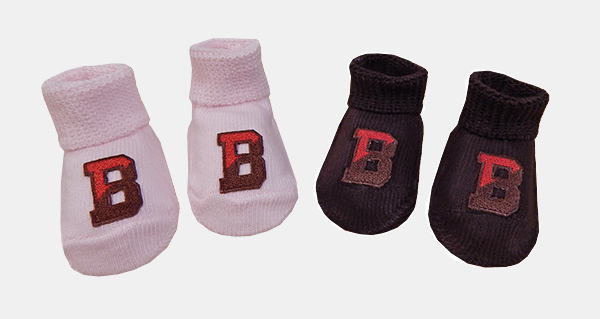 Creative Knitwear 75% cotton, 20% nylon, 5% spandex infant knit booties with half-red, half-brown embroidered 'B' with brown outline. --Brown or Pink Booties - Size: Newborn. Please select option for INF - CK Knit Newborn Booties - $10.99. 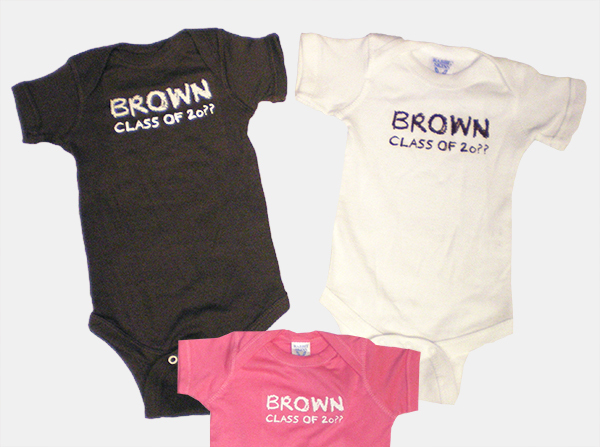 ES Sports 100% cotton 3 snap-closure short-sleeve infant onesie with 'BROWN' and 'CLASS OF 20??' imprinted on the front. Note: Limited quantities of each size. Please select option for INF - ESS Infant Class of 20?? Onesie - $19.99. 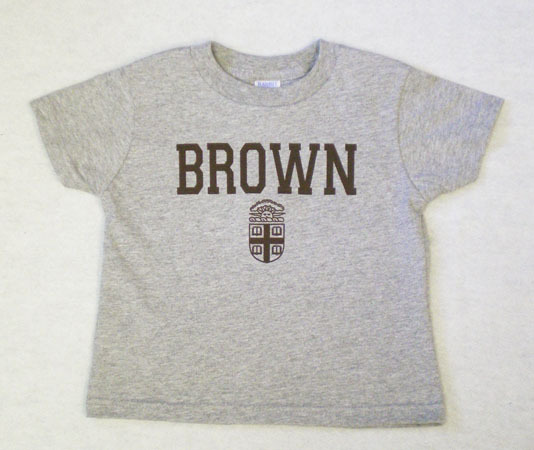 ES Sports infant grey tee with Crest and 'BROWN' imprinted in brown on front. Please select option for INF - ESS Infant Grey Crest Tee - $18.99. ES Sports grey tee with Crest and 'BROWN' imprinted in brown on front for infants, toddlers, and youth. Please select option for YT - ESS Grey Crest Tee for Infants & Toddlers - $18.99.